Home >> Dads taking care of business – by quitting smoking! Men can work on being good dads and take care of themselves as well as their little ones. National Non-Smoking Week is a great time to start up a conversation with the smokers in our lives. There are so many options these days for those who are ready to Quit Now or who are even just getting ready to think about quitting. 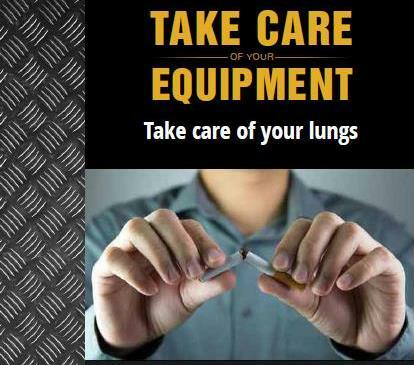 If you know a new dad who also smokes, you might want to send him to Dads in Gear (DiG) or Men’s Quit Now. Out of the men who participated in the first two DiG pilot groups – 65% were able to quit smoking, even three months later. That’s an amazing rate compared to 10% who quit successfully on their own. Targeted messaging on smoking and how to stop, but also about how men can work on being good dads and take care of themselves as well as their little ones. The program is led by two pioneers in men’s health in BC – Dr. Joan Bottorff and Dr. John Oliffe. They provided an update on the Dads in Gear project in a recent Quit Now webinar on leveraging masculinities to promote quitting. Dads in Gear brings new fathers together to talk about family, fatherhood and how quitting smoking can help them be better dads and partners. The lone, tough Marlboro Man is one image of masculinity, but working in men’s health promotion shows that image is out of focus. Men can’t be limited by that stereotype, they’re people who both provide support and need support in turn. By addressing men’s health in terms of the realities of their lives and relationships, we can engage men in a more meaningful conversation about their health – on their own terms. But rather than taking my word for it, take a listen to some of the dads who took part in DiG. They’re the real inspiration for National Non-Smoking Week.